. - Premium Compatibles Okidata 52114501 Oki B6200 10K Toner Cartridge - PCI Okidata 52114501 10K Black Toner Cartridge for Okidata B6200 B6200dn B6200n B6250dn B6250n B6300 B6300dn B6300n Made in the USA by Premium Compatibles Inc.
Innovera - Innovera Remanufactured Toner Cartridge - Alternative for Okidata (52114502) - Black - LED - High Yield - 17000 Page - 1 Each B6300 IVRB6300 pg.1377. 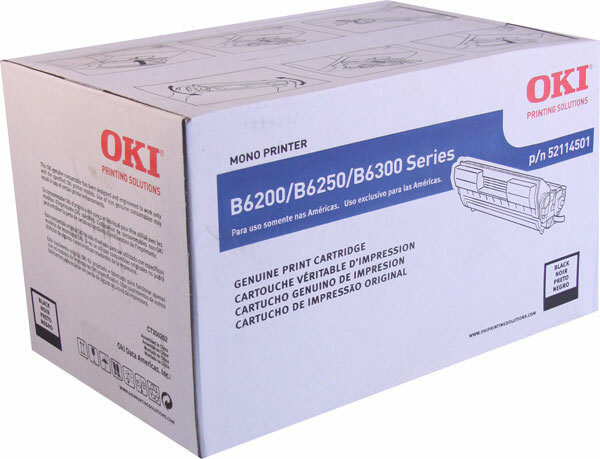 Okidata - Oki B6300n Black Toner Cartridge - Laser - 1 Each 52114502 OKI52114502 pg.1361.